In order to sustain and grow this effort to help students learn the bottom-up history of the United States, we need YOUR help to reach more individual donors. Personal requests to contribute are always the most effective, and the more people we can reach, the better. Here’s where you come in. Please join our team that is reaching out to their friends and family to contribute on Giving Tuesday (November 27) and/or in late December. You can help us reach more students with people’s history lessons by expanding our base of individual donors in 2018. After you sign up, we will send you supporting materials, including sample language and images. 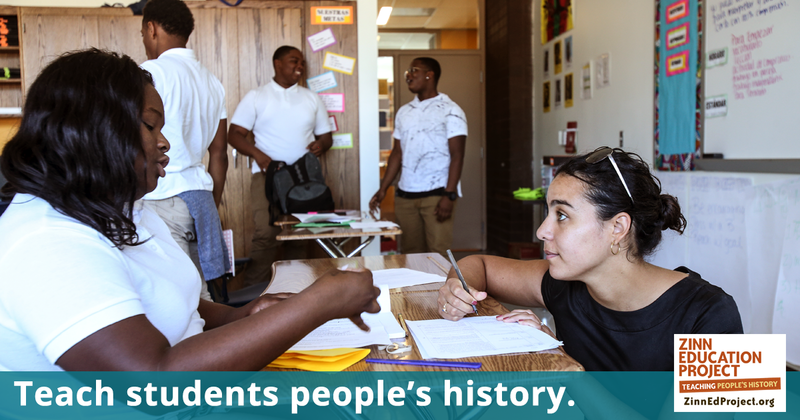 Help us reach 100,000 teachers and more than one million students with people’s history in 2019. Sign up to learn more. Last year we raised $10,000 thanks to outreach by individuals like you. This year thanks to the generous support of Dave Colapinto, all donations made for #GivingTuesday will be DOUBLED up to $10,000. Dave was a student of Howard Zinn’s at Boston University and currently works to promote the rights of whistleblowers. With your support, we can double the funds from last year.